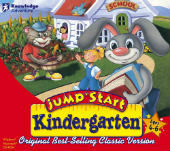 JumpStart Kindergarten takes place in a kindergarten schoolhouse. The game is hosted by the teacher, an anthropomorphic gray bunny named Mr. Hopsalot. The specifics of the game vary from the two versions, but in both the user may access educational activities and simple games by clicking on objects. In the 1994 version, all of the activities are accessible from a single screen inside the classroom. In the 1998 version, different areas of the classroom and the nearby areas outside containing activities may be explored. There is no goal or rewards in the 1994 version; however, in the 1998 version, playing activities earns the player stars.